Building a bridge made out of popsicle sticks can be a bit of fun. If you are building it for your kid or for yourself, it is truly a fun way of spending quality time crafting a miniature bridge. 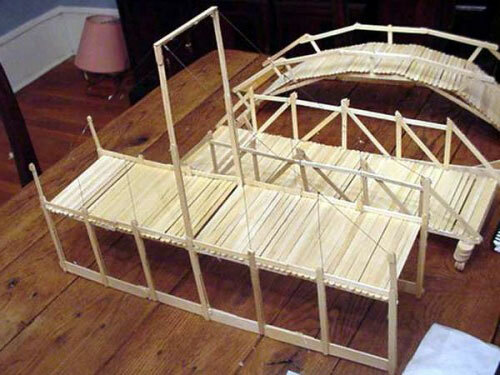 The process is a bit easy if you follow the basic and easy to follow steps in building a popsicle stick bridge. Have your materials ready such as sheets of paper, masking tape, white glue and of course tons and tons of popsicle sticks. For this simple project, you will need approximately 50 sticks. Having more popsicle sticks will not hurt. Get one sheet of paper and tape it flat on top of the table. Be sure the long side of the paper is facing you. With the use of masking tape, get two popsicle sticks tape them down at the bottom of the paper. There should be space between the two popsicle sticks. Be sure the ends of the sticks will touch the edge of the paper. Get two more sticks and measure up to 4 inches above of the first two sticks you just placed at the bottom of the paper. In order to connect bottom and the top, you need to lay a popsicle stick in an angular position leaning towards the middle. Glue the sticks together. Then, start placing popsicle sticks on a diagonal position on top of the 2nd set of popsicle sticks, and make a triangular shape right on the side. Do the same process for the other end and let the sticks dry completely. Get hold of pieces of books and spaced them out to get the right width you want your bridge to have. Take the each side of the bridge and tape both sides against the books. Get some pieces of popsicle sticks in order to connect the top and the bottom of the bridge. You need to use glue to stick them together. Make more triangular shapes as you do this process. Create a diagonal shaped brace on both ends of the bridge. Be sure that the bridge is standing tall and not leaning. You do not want the bridge to fall down. After which, you need to dry everything completely. Then, eventually you can start testing out your bridge and check how much weight it can handle.